August 2016: The August 2016 training conference for Kentucky prosecutors will contain a session about timber theft and the special prosecutorial issue it presents. The conference will be held 24-26 August at the Marriott in Louisville. About a thousand are expected to attend. Nina Cornett, a timber theft expert, Dr. Jeff Stringer of the UK Forestry Department, and Bob Bauer, an industry representative, will speak on timber theft. Representative Leslie Combs once again introduced Timber Theft and Trespass Task Force Legislation. The bill, HCR29, was filed on the fifth of January, passed from the House committee to the full House on 5 February, passed the full House on 10 February, and as of 11 February had arrived at the Senate. The session ended before the Senate took up the bill, however. Web-crawlers on timber theft have been turning up the usual rate, but one of them was wrapped in such irony that it is worth featuring here. Timber thieves entered land near Buncombe, North Carolina which was under the stewardship of the Southern Appalachian Highlands Conservancy and logged off trees that may have sprouted a hundred years ago. Apparently, conservation easements and faithful stewardship don't mean conservation after all. For more details on this theft, click here. Several noteworthy things have happened in the fall of 2015. First, I was lucky enough to stumble on Elizabeth Baldwin's blog on wood and wood issues, and learned that, for the first time, the federal Lacey Act is being applied to timber thefts inside the United States. This summer, several Washington state men, allegedly hired by a timber processor, cut valuable maple from an Oregon National Forest. They were caught, and an act that heretofore had been considered to apply only to timber harvested illegally outside the US and imported here was to my delight applied to this "inside" job. The sawmill owner has already pled guilty, and the loggers are facing an upcoming trial. This development has promise for those victims who cannot persuade their local and state authorities to act on their timber theft. It's hard to beat a federal prosecution. Second, the Kentucky Environmental Quality Commission, which reports to the governor, decided to revisit the Resolution they passed about three years ago asking the Kentucky Legislature to take action on timber theft. I attended their 24 September meeting, where they decided that the Resolution needed to be toughened up. They passed a new Resolution which does that, and sent it to the Legislature in advance of the session which will convene in January 2015. You can find the text of the draft Resolution here. Around the same time, a Legislative Interim Joint Committee on Natural Resources and the Environment set a hearing on timber theft. Tom Fitzgerald of the Kentucky Resources testified at the hearing, and recommended that the General Assembly pursue the issue. Fourth, National Public Radio aired a story on timber theft shortly after the Legislative hearing, which brought even more attention to the problem. Fifth, Mike Feldhaus hosts a podcast for Kentucky Farm Bureau, and this week he had Frank Hicks on to talk about timber theft. Frank is the President of the Kentucky Woodland Owners Association. You can listen to the short podcast here. Sixth, and finally, Elizabeth Baldwin was kind enough to write about Kentucky and timber theft on her blog. She published a four-part series across October. You can find the link here. In the first quarter of 2014, Nina Cornett was appointed to a three-year term on the Kentucky Supreme Court's Access to Justice Commission. Her Commission meetings take place roughly three times a year, usually January, May, and September. She solicited comments about citizens' experiences with the Kentucky civil justice system, and about suggestions for improving access to that justice system in Kentucky. A number of news articles about timber theft have come out in the last quarter, many of them related to arrests and prosecutions by the state of Louisiana, which is very active in preventing and prosecuting timber theft. Look for them to be posted here over the next weeks. "Many of the occurrences of recent thefts are typical for the timber industry, but continue to persist in spite of the fact that these could be stopped or at least curtailed with some relatively minor changes in practices, policies and procedures. Today's issues seem to fall into four general categories:...."
Google Alert Results on words "timber theft"
Since the three weeks in December 2014 mentioned below, the volume of google alerts on timber theft stories or victims who have contacted this web-site or the timber theft web-site make it impractical to list them all individually, and there will be no effort to do that. With respect to these latest google alerts, the alerts came from across the US. They brought stories from Louisiana, Maine, Michigan, Mississippi, New York, Pennsylvania, and Ohio, and also from abroad. The stories cover mostly arrests, and so tend to come from those states that have improved their laws and their actions in pursuit of timber theft. Few stories turn up from Kentucky and Ohio, who have not yet reached that point. Not every story carries a loss amount, but the Pennsylvania story mentioned almost $76,000 in losses and damage. Readers who would like to learn more about incidents of timber theft across the country may want to establish a google alert on the words "timber theft" to have that information delivered directly to their mailbox. With respect to contacts through the web-sites, it is policy not to mention names so are not to imperil either any potential redress nor open victims to actions against their personal or economic safety. However, here is one story without the names: An elderly couple who own 300 acres in the vicinity of Somerset, KY have been in a fight to defend their land against timber thieves for roughly 35 years, their daughter says, and with no help from either law enforcement or Kentucky Forestry. They have been in court ten years on the latest incident and suspect the defendants are trying to outlast them. Their experience mirrors that of so many other victims that their daughter says the Guide For Timber Theft Victims is eerily like the difficulties they've suffered through. 24 Dec 2014: JENA MAN FACING MORE THEFT CHARGES. 24 Dec 2014: MORE CHARGES FILED AGAINST JENA MAN FOR TIMBER THEFT. 23 Dec 2014: ADAMS MAN CHARGED IN TIMB ER THEFT CASE TOTALING $200K. 23 Dec 2014: MORE CHARGES FILED AGAINST LaSALLE PARISH MAN FOR TIMB ER THEFT. A second article describes efforts by India to crack down on timber theft, including renumbering trees (http://gowood.blogspot.com/2013/10/timber-theft-little-noticed-but-serious.html). The site cites a Wall Street Journal article about timber theft in the far east, including a video of a Russian landowner who is forced to defend his trees without any help from the authorities, as is all too often the case here in the US. Among reasons cited for the lack of official action is corruption, which is reminiscent of reactions here as well. The most recent article (15 November 2013, http://www.therepublic./view/story/6e9b78f8205a4d9abe06799d514b13ae/MN-Timber-Theft) describes the theft of almost two thousand trees from state land in Minnesota. In spite of the magnitude of the theft, from which would have yielded the couple charged with taking the trees $150,000 to $200,000, the arrested couple has been charged with a misdemeanor only, and the maximum penalty they will be subject to is a $3000 fine and a year in jail. This typifies the attitude in the US that stealing trees in not really stealing, but any prosecution is in fact a step forward from the attutude that stealing trees, no matter the magnitude of the theft, is a civil matter. google-alerts also turned up the theft of several hundred trees from a city park in Charleston, West Virginia this past summer. As of last reading, the authorities had not acted to initiate a criminal case, and the Parks authority is contemplating filing a civil suit rather than let the person accused escape altogether. On Saturday, 22 September, fourteen Berea students, two parents, and four faculty/staff members came to Eastern Kentucky to learn traditional Appalachian skills. The students, Andy Brown, Amanda Burns, Kendal Carter, Aja Croteau, Claire David, Eva Griffin, Brad Niederriter, Ric Reichart, Yoshua Reece, Jarrett Robertson, Carolyn Romano, Becca Shaw, Corey Smith, and Matthew Woodward (along with Matthew's parents, Rita and Scott) are part of a Sustainability class taught by Professor Richard Olson of Berea. Berea faculty/staff were represented by Professor Olson, Cheyenne Olson, Chair Peter Hackbert, and Louisa Summers. This is the fifth or sixth of these Skills Days, which generally take place in September or October each year. The annual event is organized by Dean and Nina Cornett, and hosted by John and Dorothy Back. This year the skills demonstrated included preserving fish by smoking (Dean Cornett) and green beans by threading, hanging, and drying (Nina Cornett), producing maple syrup from tree tapping to the final product (Lee Cornett, making soap (Jim Haynes), making hominy from shelled corn (Jim Haynes), and Appalachian story-telling (Richard Smith). The event also included home-cooked meals with traditional Appalachian desserts such as stack cake and dutch-oven cake, and music by John Back, Dorothy Back,and Hugo Back. See Photos Section for more photos of event. After roughly half a dozen years of bringing students to Eastern Kentucky to learn traditional Appalachian skills, Berea College hosted an Appalachian Skills Festival on the campus at Berea in April 2012. Skills demonstrated were hand-shelling ears of corn and hand-grinding the kernels to make natural, unstripped cornmeal (Bill and Billie Jo Caudill), basic blacksmithing (John Back), caning chair seats with hickory bark (Randy Campbell), knife, tomahawk, and ax throwing (Richard Smith), soap making (Jim Haynes), hominy making (Jim Haynes), and threading, hanging and drying green beans for winter preservation (Nina Cornett). The event was coordinated by Dean Cornett of Eco-Outpost, Professor Richard Olson of Berea, and Cheyenne Olson of Sustainable Berea. Other Eastern Kentuckians who attended and supported the efforts were Dorothy Back, Nancy Campbell. and Libby Smith. 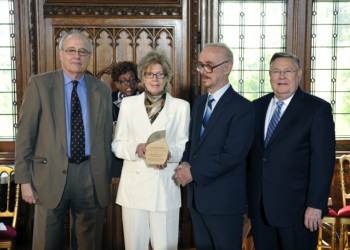 9 April 2012: The Kentucky Environmental Quality Commission, which annually honors Kentucky individuals and organizations for outstanding environmental stewardship, this year presented a Lifetime Achievement Award to Dean and Nina Cornett of Blackey, KY. The awards presentation took place on Friday, 13 April 2012 at twelve noon at the Berry Hill Mansion, 700 Louisville Road, Frankfort, KY. Bobbie Ann Mason, noted Kentucky author, offered the keynote address at the ceremony, which is open to the public. - Establishing a non-profit corporation (web site http://www.ecooutpost.org) which supports environmental efforts across Eastern Kentucky. - Heading a clean-up committee that cleared more than 200 tons of trash from their small town, trash that when collected and piled for removal, comprised a stack one-hundred (100) feet long, sixteen (16) feet deep, and as much as seven (7) feet high. and New England PBS stations, and will next air on KET-KY on Saturday, 21 April 2012 at 9:30 p.m. The annual awards, which were instituted in connection with Earth Day, generally are presented each April. For more information about the Cornetts, their environmental efforts, and their environmental videos, visit the following websites:http://www.cornettmedia.com or http://timbertheft.weebly.com, or call 606-633-9546. 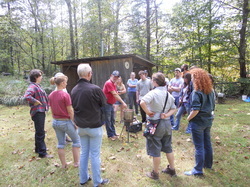 On a beautiful Saturday in October, a group of Berea College students, accompanied by Professor Richard Olson, Cheyenne Olson of the college staff, and a faculty member from Wayne State University in Detroit came to Eastern Kentucky to learn traditional Appalachian skills. The students are part of a Sustainability class taught by Professor Olson of Berea. This is the fourth or fifth of these Skills Days, which generally take place in September or October each year. The event is organized by Dean and Nina Cornett of Eco-Outpost and hosted by John and Dorothy Back at their mountain cabin. The skills demonstrated included using traditional hand tools to shuck and shell corn,grind the kernels into corn meal and use the dried shucks to make a corn shuck mattress, making soap, making hominy from shelled corn, caning a chair seat with hickory bark, using a shaving horse (a traditional hand tool) to make furniture legs. and threading, hanging, and drying green beans for winter. The day also included Appalachain stories, music, and food, including stack cake and fried pies.The demonstrators included John Back, Randy Campbell, Bill and Billie Jo Caudill, Nina Cornett, Jim Haynes, and Richard Smith, along with a supporting cast. The music was provided by John Back, Dorothy Back, Hugo Back and some of the students, and Richard Smith was the story teller.